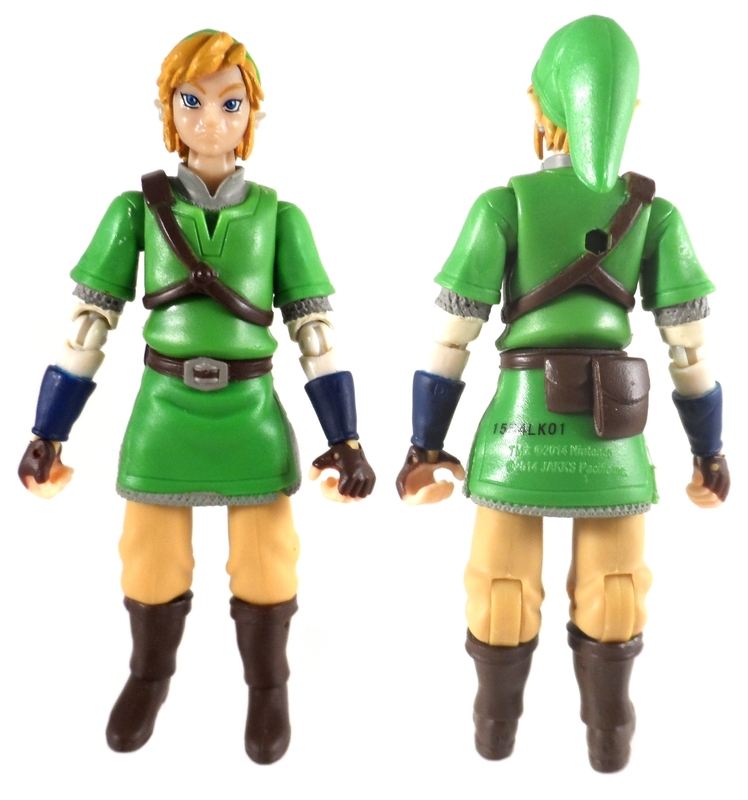 Jakks Pacific has come out with series 1 of the World of Nintendo action figures and we’re looking at the star of The Legend of Zelda series, Link! 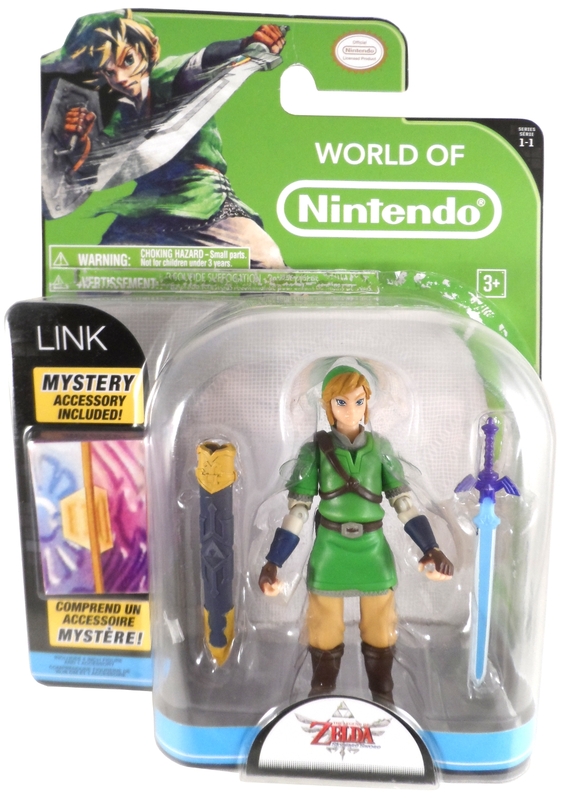 Link comes on a basic World of Nintendo card, but this one is all green (unlike the typical red cards the other figures come on) The packaging shows off the figure, accessories and a box that holds a mystery accessory. The card features artwork from The Legend of Zelda Skyward Sword game. 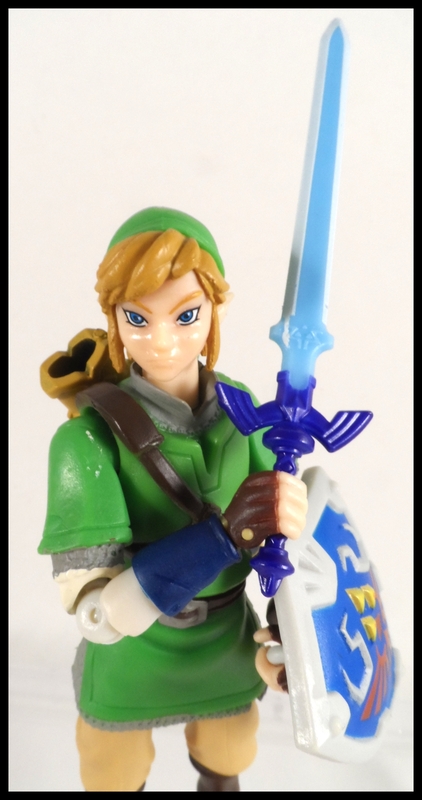 The Link figure is based on his appearance from Skyward Sword. The design is a classic one so even casual fans instantly know who this is. The arm articulation is comparable to Microman figures. The articulated wrists and elbows allow for a great range of motion. The knee joints are one of the few times I’ve seen baggy pants look natural no matter how the knee is bent. Unfortunately the hip articulation is hindered by the rubber skirt which could use longer slits on the sides to allow the hips a better range of motion. 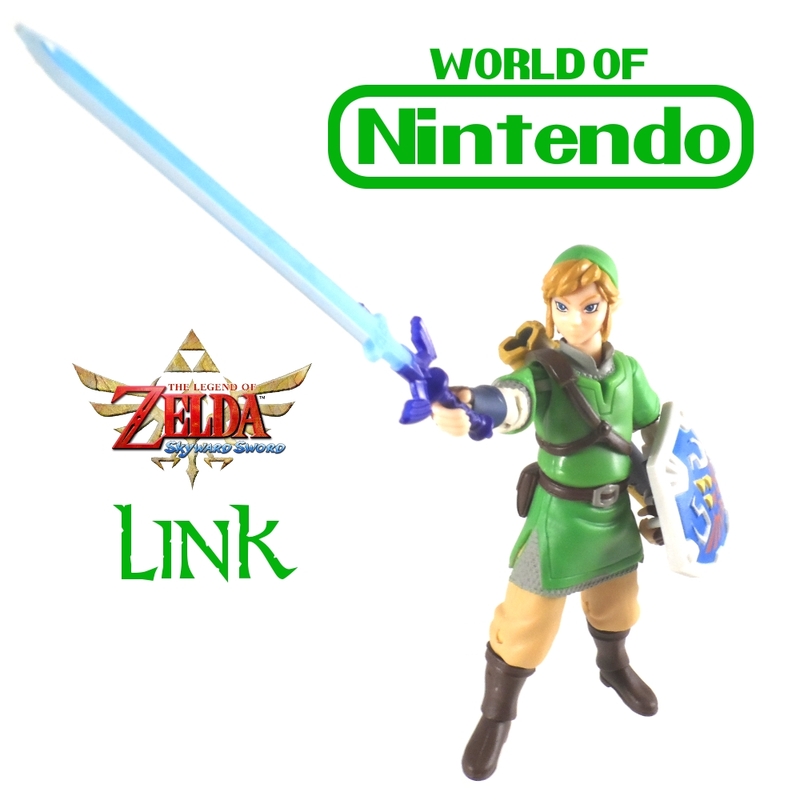 Link comes with the Master Sword. 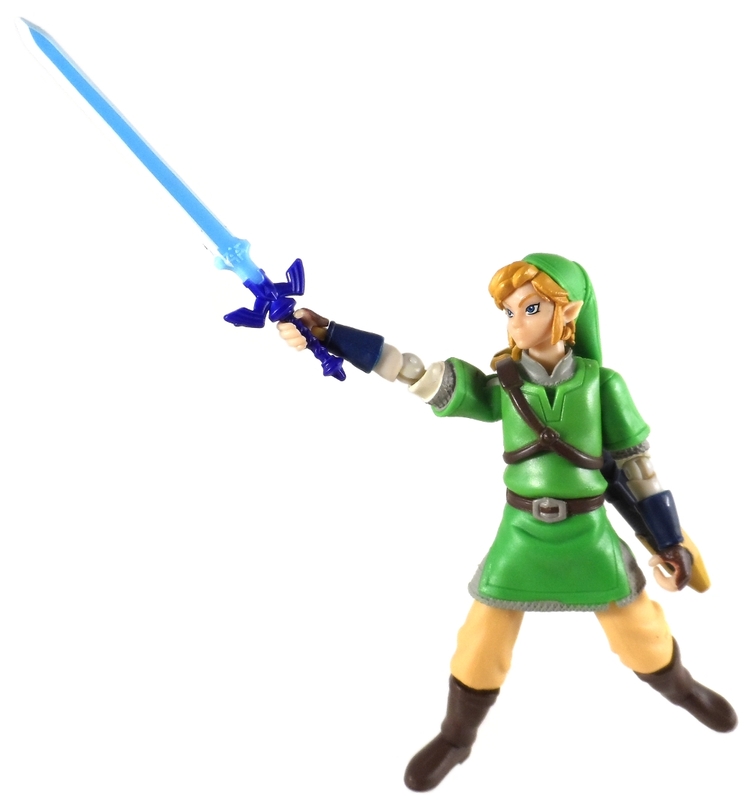 Link’s right hand is angled to hold the sword in a more natural position. 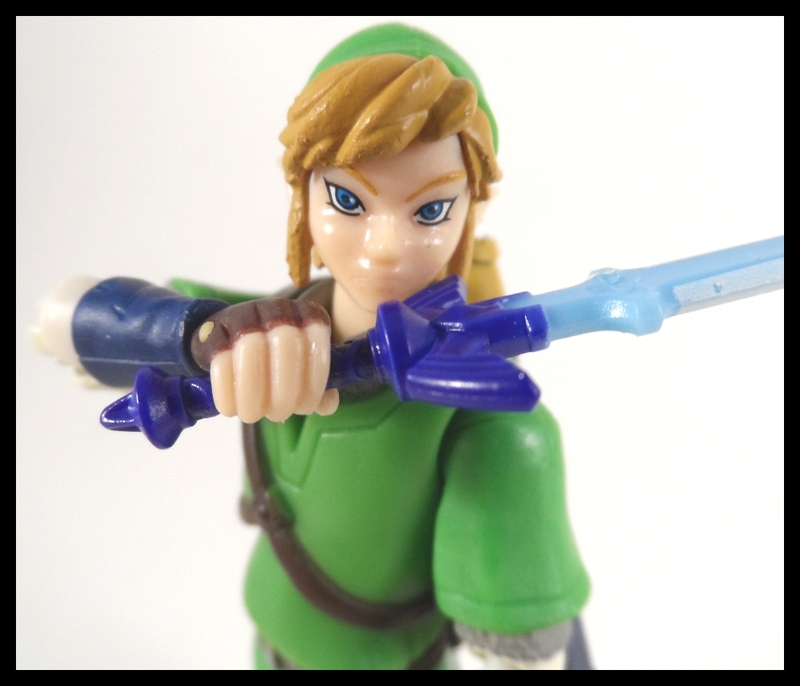 The Master Sword sculpt has some great details in the hilt and features the Tri-Force on the sword blade. 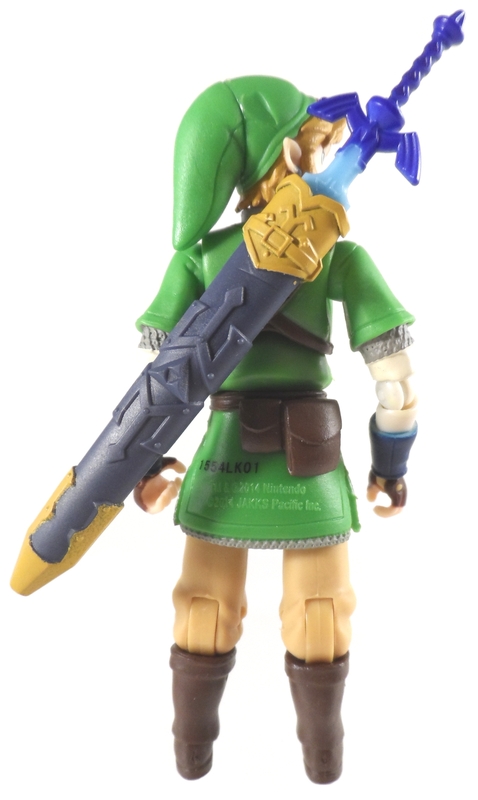 Link also comes with a sheath for the Master Sword. 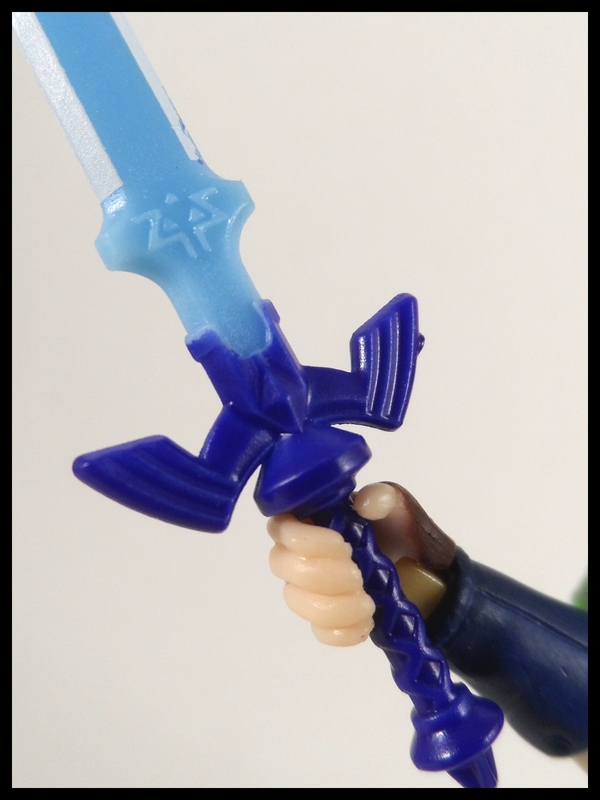 The sword can fit further down the sheath with a little force. Since the widest part of the blade has no paint on it, you don’t have to worry about paint wear from repeated use. The sheath has a lot of sculpted details on it. 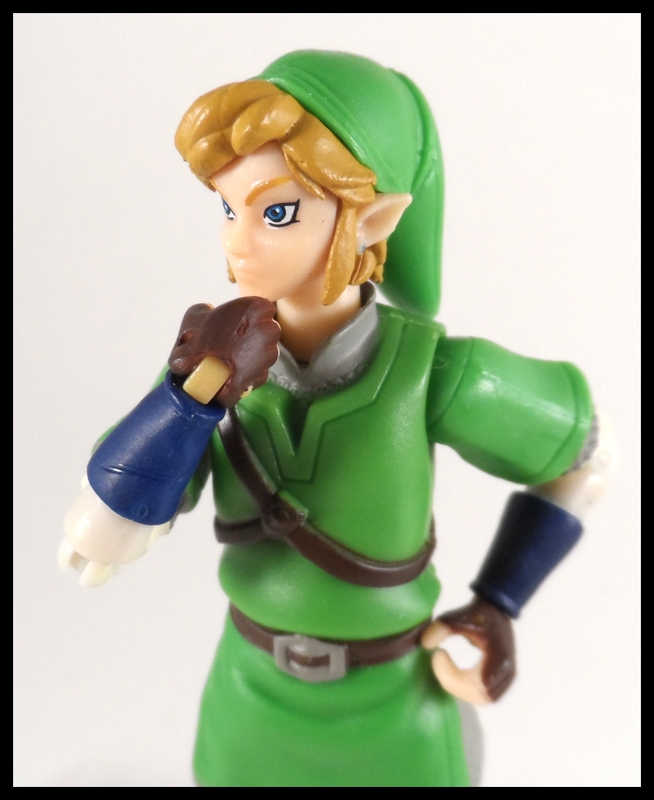 The “Mystery Accessory” is a Hylian Shield. The shield has both sculpted and painted details. The bird is painted, but the other details are sculpted. 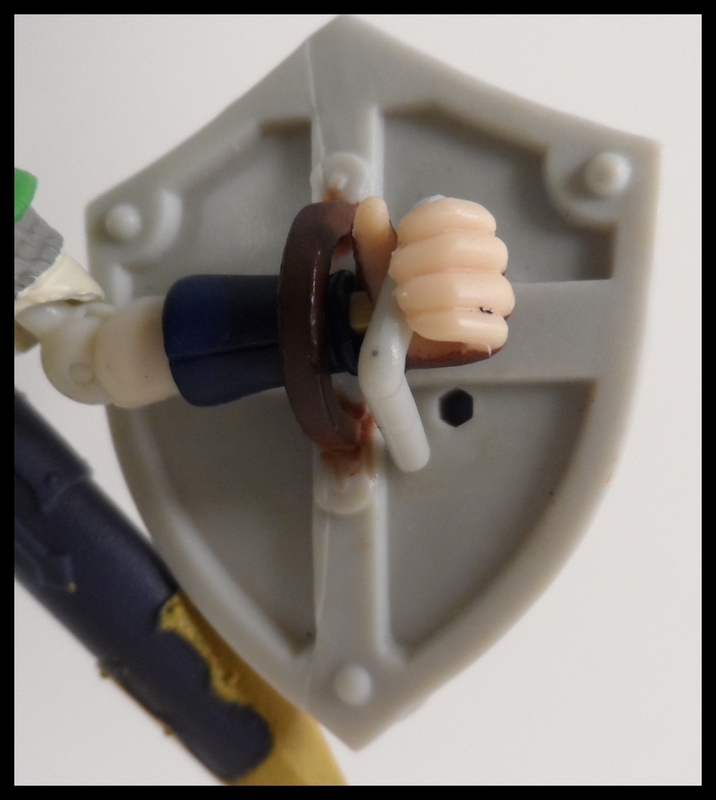 The bottom of the handle can be pulled out of the shield to allow Link’s hand to get under the handle. You can then plug the handle back into the shield to complete the look. The figure looks great with a nice sculpt. The arm articulation allows for a lot of poses and interaction with the weapons. 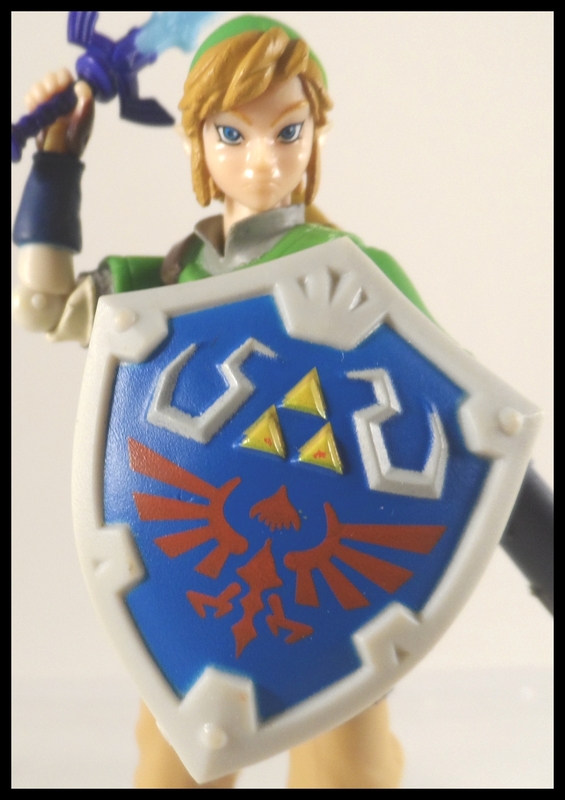 The left elbow on this figure is fairly loose and not strong enough to hold up the shield well. This may not be a common problem as the right elbow had no problem supporting the weight of the shield. 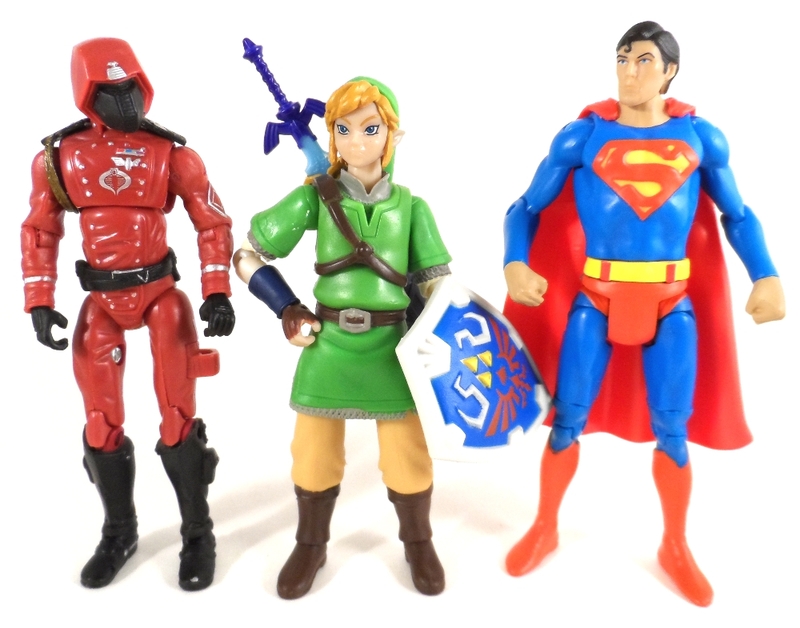 Link stands a bit shorter than other 3-4 inch figures, but that fits as Link should be a bit shorter. 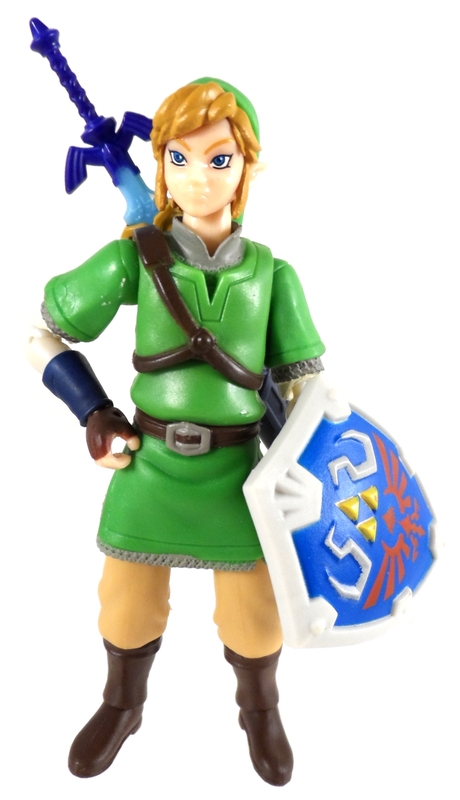 This is a nice figure of Link with all of his essential accessories. Tack on a load of articulation and a nice sculpt and you have a must buy retail figure. 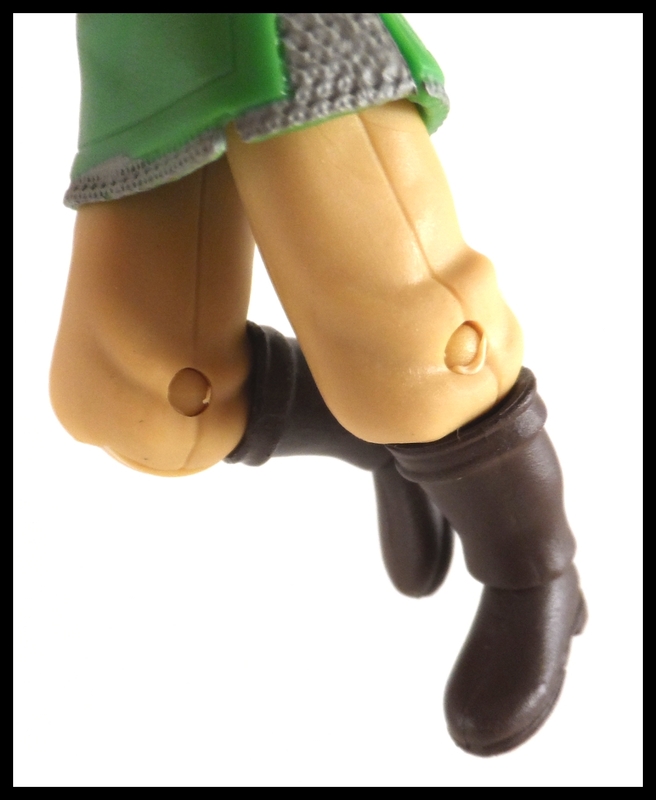 I think a minor adjustment to the skirt will help the leg articulation a lot. This is a great substitute for anyone frightened off by the high price of the recent Figma action figure.